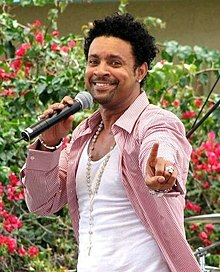 Orville Richard Burrell CD (born October 22, 1968), kent maistly bi his stage name Shaggy, is a Jamaican-American sangster-sangwriter an DJ. He is best kent for his hit singles "Oh Carolina", "Boombastic", "It Wasn't Me" an "Angel". ↑ "Shaggy – Biography of Shaggy". PoemHunter.com. November 3, 2012. Retrieved November 3, 2012. This page wis last eeditit on 19 November 2017, at 19:13.